Like it or not, the Conservatives reached their majority last night while the Liberals got their worst government in their history (since Confederation): 3rd place behind the NDP. With that, Michael Ignatieff announced today he has stepped down as leader of the Liberal party, after losing his Etobicoke-Lakeshore seat he was parachuted into back in 2006 (a very strong Liberal riding for many years). Ignatieff was certainly no friend to the Ukrainian Canadian community, denouncing Ukrainian nationalism and labelling it anti-semitic in his book Blood and Belonging. He has never really renounced these passages. Sadly Etobicoke-Centre MP also Borys Wrzesnewskyj lost his seatto the Conservatives by only a mere 26 votes, and a recount will be under way. When Ignatieff became the Liberal leader in 2009, he sacked Borys from his shadow cabinet only to promote him back months later amid his sagging popularity. 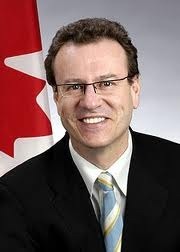 Borys was a champion for Ukrainian and Eastern European causes on Parliament Hill, and was instrumental in Canada passing a law recognizing the Holodomor as genocide. His service will be sorely missed from the community, thank you for all your hard work! I just wanted to point out that Borys Wrzesnewskyj is highly anti-choice , and I just can’t get behind that, despite his shared heritage. I totally appreciate this site, and am sure that you were unaware of that, but just wanted to share, because that is a major human rights issue. Considering the Conservatives outnumbered Liberals 4-to-1 on that list and now their majority, I think that cause is in more trouble now than ever. Absolutely. Did you see the list I posted? Quite scary. Thank you for your response. I know it was kind of beating a dead horse, since Borys is no longer an incumbent, but just wanted to bring it up. I caught an interview with Borys on Svitohlad where he condescendingly dismissed allegations about Iganitieff’s smears against the Ukrainian people. Borys’ primary concern was for Borys not for his Ukrainian ancestors and heritage. He was truly doing his Count’s bidding like the good traitor he was. Oh come on, I don’t know of too many jobs where one can openly speak against one’s boss… he had not choice, had to go with the party line in this case. I recently learned that many individuals from Ukrainian diaspora who live in the riding, voted against Borys and even openly campaigned against him!! I find that absolutely appalling. Borys brought many Ukrainian issues/causes to the forefront and now with the democracy and in fact the entire existence of the country at stake, we need someone in the Canadian government who understands these issues more than ever. Why is it that other minorities can get behind their own candidate en masse even if they usually vote for a different party? For example Italian Canadians in Vaughan voting in Conservative Fantino and even when they don’t actually need an Italian Canadian candidate because the freedom of their country is hardly an issue. Why can’t Ukrainian Canadians? Is it something in our genetic make up? I’m starting to believe what my grandmother always said, that there is a reason, we never really had independence, it is because we’ve always preferred and found those who were not our own more appealing; and that we were not Russified in the East or Polonized in the West because these cultures were imposed on us, but because we wanted to be. Truly, we don’t need the enemies to destroy us, it will be an inside job.